Prairie Public Broadcasting, Fargo, North Dakota, 2015, 60 minutes, DVD. Hay Day: Musical Barns of North Dakota pays tuneful tribute to the barn, a rapidly disappearing icon of our Midwestern landscape and agricultural heritage. The documentary explores the architecture, history, preservatiom, restoration and cuurent uses of seven barns, accompanied by barn dance music from The Radio Stars, Rhythms of the Heart, Tigirlily, The Hay Shakers and more. The documentary project has also grown to include a music CD and a beautiful coffee table book produced by Preservation North Dakota. The documentary features these barn owners who use their building in a variety of creative ways, much to the delight of friends and neighbors - Bruce Stein, Hankinson; Elroy Lindaas, Mayville; Evonne Piepkorn, Stanley; Harvey Huber, Hazen; Goerge Ehlis, Dickinson; Scott and Ermaline Schlepp, Ashley; The Welk Homestead, Strasburg. The Huber, Schlepp and Welk barns relate to the heritage of the Germans from Russia in North Dakota. 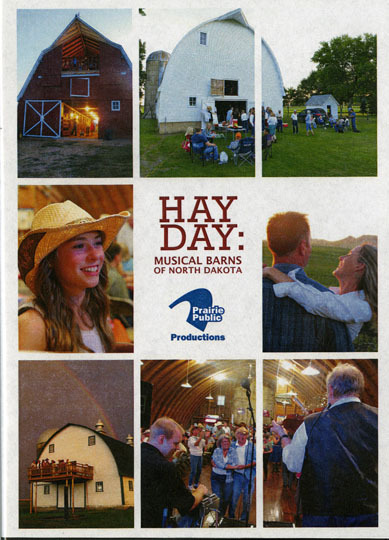 Production funding for Hay Day: Musical Barns of North Dakota provided in part by Gate City Bank, BSNF Railway, North Dakota Farmers Union, State Historical Society of North Dakota and the members of Prairie Public.